We're a quarter through the NFL season (already?!) and have a pretty good idea of the defenses to attack at certain positions. When looking at who to play at QB, the Saints are one of few defenses to target. Alex Smith gets the pleasure of this matchup against the defense allowing an average of 27.9 fantasy points to the position. Water is wet, the sky is blue, and Leonard Fournette is injured again, what's new? Those who hung onto T.J. Yeldon have been gifted a top-15 running back this week. Yeldon & Co. square off against the Chiefs who are allowing an average of 37.9 fantasy points to the position. While I wouldn't expect Yeldon to necessarily score over 30+ points, I would expect a ton of volume and opportunity on Sunday. Fire him up this week and watch the fantasy points roll in. With Casey Hayward possibly shadowing Amari Cooper for most of the game, this leaves Jordy Nelson lining up across the field in a matchup he should be able to take advantage of. Nelson will be looking to increase on his last two weeks in which he has posted 11 receptions for 221 yards receiving and 2 touchdowns. Carr may have found his Crabtree replacement in Nelson and owners should take notice if they haven't already. 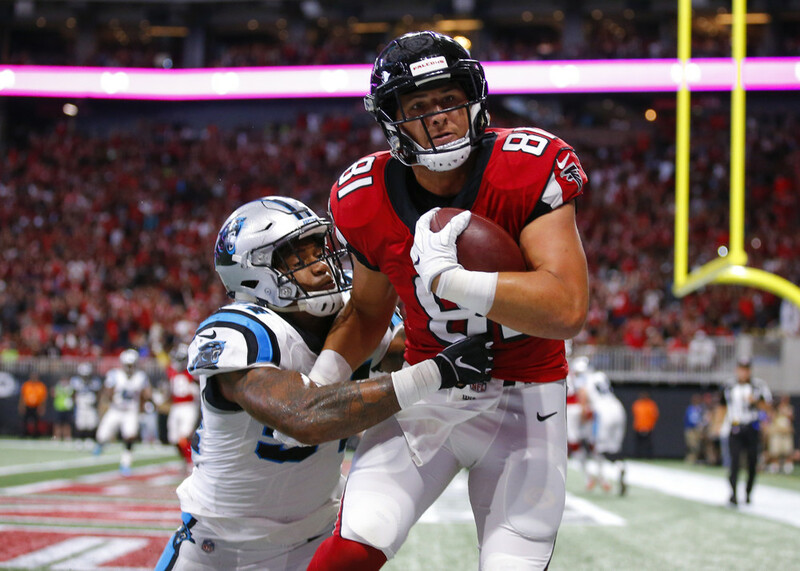 While Austin Hooper hasn't been a target-monster over the first 4 weeks, he is part of a high scoring offense and that sets up nicely against this week's opponent: the Pittsburgh Steelers who are giving up massive numbers to tight ends this season. The Steelers D is giving up an average of 20.5 fantasy points to the position and Sunday's game expects to be a high scoring affair with the total currently set at 57.5 and Hooper should have more than a few opportunities to find the end zone this week. Through 3 weeks, Graham Gano hasn't been what owners have hoped for - two 8 point outings and another with 4. Look for Gano to bounce back this week against the Giants who are allowing over double-digit fantasy points (11) to the position through 4 weeks including surrendering 12 and 16 points respectively in their past two games against the Texans and Saints. The Green Bay defense last week showed how helpless Josh Allen is in the Bills offense. Bills QBs have been sacked a minimum of 3 times each of the first 4 games and are giving up an average of 13.5 fantasy points to opposing defenses. The Titans D are a no-brainer streaming option this week. C.J. Beathard was average last week against the Chargers and finished with 17.8 fantasy points. This week he faces a much tougher challenge against a Cardinals defense that only gave up 5.6 to Trubisky and 9.0 to Wilson in Weeks 3 and 4 respectively. In addition, the Cards have only surrendered 3 touchdown passes in 4 weeks, not bad! Those still streaming the position should look elsewhere (Bortles, Mariota) this week. On a short week on the road, Jordan Wilkins doesn't have a clear road to success against the Patriots. In a game where the Colts should be trailing by multiple scores, watch for Nyheim Hines to be heavily involved in their game plan, instead of Wilkins who is coming off an 8-16-0 rushing performance. Chris Hogan's opportunity was during the first four weeks of the season while Julian Edelman served a suspension. In that time he posted 8-109-2. Ironically, he was most likely on owners' bench when he scored the 2 touchdowns. Owners will need to see how Edelman's return to the offense either hinders or helps Hogan's opportunities in the Patriots offense, and it's not a gamble I'd take in Week 5. While the New Orleans Saints defense hasn't been great at all this season, one spot they haven't been destroyed at is against the tight end. The season high in yardage allowed during a single game this year is 54 yards, and they haven't allowed a TD yet. Jordan Reed is currently averaging 11.6 fantasy points and if the defense continues to guard the position as they are and allowing the opposition's wide receivers to do the damage, Reed could find himself under double-digit fantasy points in this contest. While the Saints defense is giving up an egregious amount of points this season, one thing they have been limiting so far is points to the opposing kicker. It looks like the other team scores a touchdown or the defense keeps them out of the last third of the field. While this is to be seen if the trend will continue, Dustin Hopkins, who has been decent this season, may not get as many points as everyone may have originally thought coming into this one. Pick up another high scoring kicker and leave Hopkins to the free agent pool. The most fantasy points that have been scored against the Kansas City offense this year is -1. Negative One. While the Jacksonville defense isn't one to mess with, the Chiefs just have so many ways to beat their opposition. Every week they're a threat to score 35+ which can't be said about most offenses in the league. While it's hard to bench Jacksonville and roster 2 defenses for the week, owners may find themselves heading into the afternoon games wishing they had streamed an easier matchup.